Possible to bloom beautifully, inspiringly among the rocks of your existence. 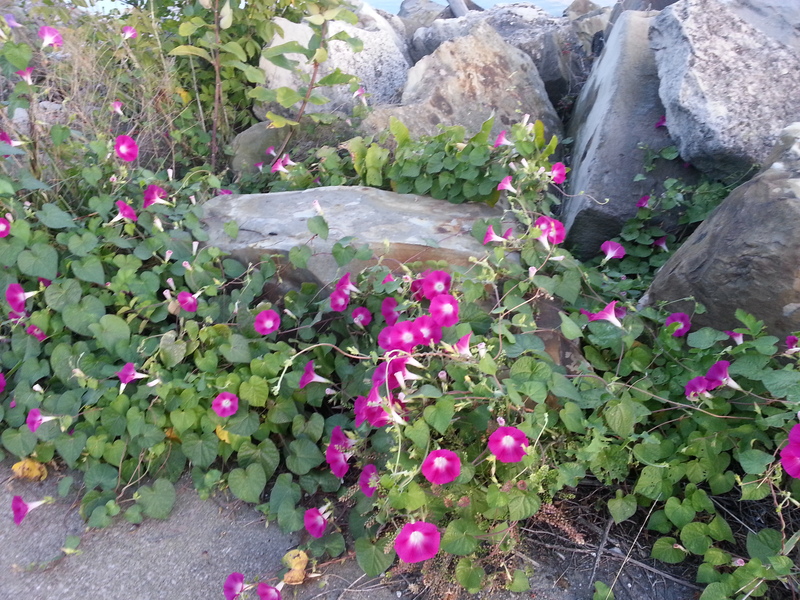 These blooms, I’m not sure if they are weeds or flowers, but they catch my eye and thought every time I walk along the lakefront of my city’s national treasure, Lake Erie. I’m intrigued at the life that springs forth from boulders of rock, strangling weeds, litter and debris. I’m constantly reminded, it is possible, possible to live out of your rocky, stony, hard, difficult, seemingly crushing existence. Life. Illness. Heartbreak. Unexplainable craziness. All of it. Whatever it is, whatever mold of its shape. Because HE, our God is The a Lily of the Valley, it is possible to bloom in the hard places of our lives. Oh it seems we are crushed under the weight of the boulders, crumbled to despair, fear and hopelessness, but I tell you there is life blooming, never giving up under the pressure. Blooms, pushing through, intertwining and weaving, slipping out of the chokehold, breathing beauty and life and hope. Blooms, opening up to reveal God’s grace and promise. They seem to say, ‘See Me, I Am your God in the midst of these rocks’. Those boulders, they have their purpose, providing a fortress against other forces and elements that may indeed destroy us, BUT. When our foundation is solid. When our walls are secure. When our faith is anchored. When our commitment and confidence is unwavering. We bloom life through the hard and the high places. God gives it, He restores the life, He springs it forth as a new thing. Sometimes it is so dark, painful, hard, disorienting, and scary as what, BUT. I’m telling you, bloom through it. Right, directly buried in The Rock (Jesus, The Christ). Yes, God is giving You LIFE.